Disclaimer: I was provided with a complimentary copy of The Sensory Child Gets Organized for review purposes. The opinions expressed are my own and have not been influenced in any way. Tomorrow is the first day of school for The Boy. It's time to get back into a routine and try to provide some kind of organization. So when approached to review The Sensory Child Gets Organized by Carolyn Dalgliesh, I jumped on the opportunity. The book provides a clear sense of what a "sensory child" looks like and helps parents assess and understand how their child learns best. Through objective observation and journaling behaviors, parents can determine their child's learning preference: Visual, Auditory or Tactile. Once a parent understands their child's learning style, organization can begin. Dalgliesh breaks down how to design a room based on your child. She encourages parents to let go of the "specific vision of how our child's room should look based on a magazine picture" and to create a room tailored to meet the child's specific needs. The section on "Sensory Organizing and Storage Systems for the Bedroom" was especially helpful. I've written how I've organized The Boy's room but it needs to be maintained and obviously there's always room for improvement. What I really love about this book is that it goes beyond organization within the home. The last chapters of The Sensory Child Gets Organized focus on helping your sensory child tackle the great wide world. 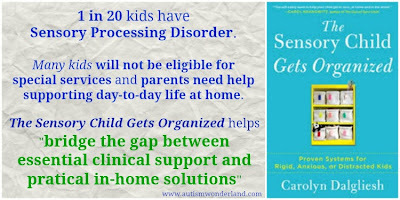 The Sensory Child Gets Organized is an excellent resource for parents and provides real solutions and suggestions that any family can follow. About Carolyn Dalgliesh: Carolyn founded Systems for Sensory Kids, LLC, a leading edge organizing model that bridges the gap between clinical support and practical in-home solutions for rigid, anxious, and distracted kids. 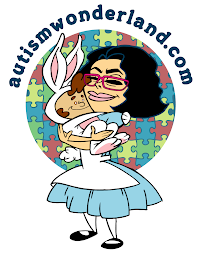 In addition to her sensory organizing work with families, she has published numerous articles and presents regularly at conferences for parents, caregivers, and educators. 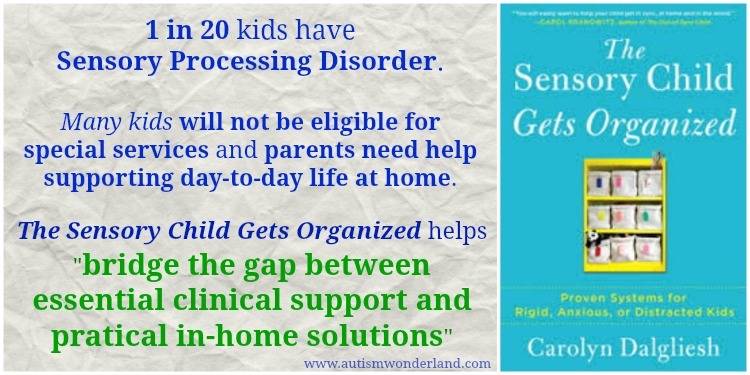 The Sensory Child Gets Organized is available on paperback and Kindle.